New research from scientists at the Ariel University in Israel has indicated the hubristic tendencies of employees at the now-ceased Enron energy company, by analysing the email corpus of the company via a text mining algorithm. “Hubris is a known risk for leadership failure. We show that hubristic tendencies can be detected semantically ex-ante in textual reports, and offer a novel methodology aimed at detecting real-time hubristic propensities. “The methodology employs text mining based on natural language processing (NLP) on Enron email corpus. NLP can capture information about employees and predict change patterns. 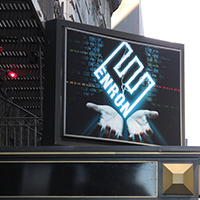 “Employing NLP real-time mechanism, Enron executives’ hubristic tendencies were detected. “Findings indicate that hubristic expressions amongst senior executives are significantly more frequent than amongst their non-senior counterparts, and that the frequency of hubristic expressions increases the closer one gets to Enron’s collapse.